Have you ever had to patch a hole in your home? What size hole was it? And where? For smaller holes, a little putty or spackle should do the trick. But for larger ones, well, you might have to patch them up with a fresh sheet of drywall. Just as you might need different types of materials to mend your walls, your dentist uses different types of filling material to fill cavities in your teeth. Most people are familiar with silver fillings. But some folks may think that these types of fillings are outdated or dangerous. Let’s sort out the facts and introduce you to the cast of characters your dentist works with on a daily basis. Those silver fillings are really an amalgam of different metals, including tin, silver, copper, and mercury. Don’t be concerned about the mercury in these fillings; when combined with other metals, it forms a safe, stable material. According to the American Dental Association, amalgam poses no health risk and is a safe and effective filling material. Toxicology International has a great report on amalgam safety if you’d like to read more. Amalgam is less expensive than other types of fillings and is extremely durable. It is used to fill larger areas of decay as well as the teeth that endure a greater degree of stress on a daily basis (your molars, for example). Amalgam also hardens quickly, which can be useful for a patient who may be unable to sit still for an extended period of time, such as children and those with special needs. Also known as “tooth-colored” fillings, composite resins are composed of a glass or quartz filler. They can mirror the color, texture, and luminescence of your own teeth, making them a great option for those of us concerned with maintaining a white smile. They also help your natural tooth structure to remain intact and bond more securely with your tooth than amalgam fillings do. Composite resins do have some drawbacks: they may create some mild sensitivity for patients, and may stain with coffee, tea, or other foods and beverages. Composite resins also may not last as long as amalgam. The gold standard in terms of durability is, well, gold fillings. Able to last two decades or more, they are composed of gold, copper, and other metals. Gold is used in inlays and onlays, as well as gold foil restorations. Most dentists these days do not offer gold foil restorations because the technique requires highly specialized training. Most commonly made of porcelain, ceramic is used in inlays and onlays. They are tooth colored and more resistant to staining than composite. However, they are more brittle and more expensive. This is a filling material composed of acrylic and a component of glass called fluoraluminosilicate (bonus points if you can pronounce that one right!). One advantage of glass ionomer is that it releases fluoride within the tooth, which can help prevent further tooth decay. However, glass ionomer is less durable than other fillings. For that reason, dentists use it in baby teeth or smaller parts of teeth that aren’t used for the heavy lifting of daily life (munching, crunching, etc.). 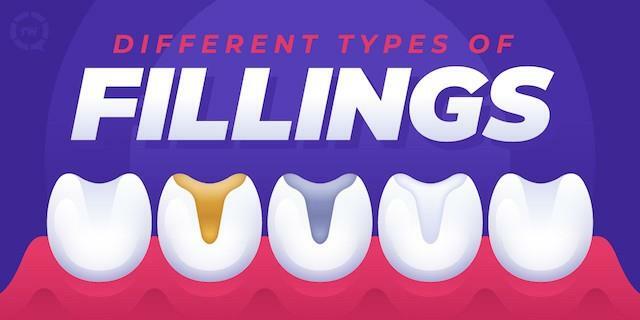 Plus, this type of filling does not match the color of your teeth as well as composite resins. Did You Ever Know There Were This Many Options? When it comes to patching tooth decay, your dentist will help you decide your best filling or restorative options based on the severity and location of tooth decay, as well as your budget. There may be only one type of filling that your dentist recommends for a particular area of your tooth, but at least you’re more informed now about what they’re recommending! Visit our Restorative Services page for more information and videos.